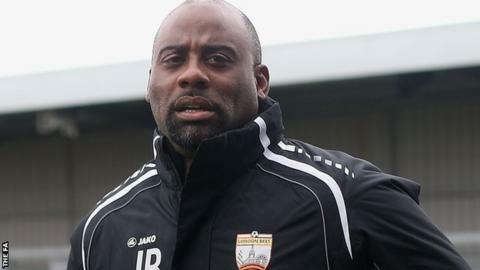 London Bees boss Julian Broomes feels his side could cause a few surprises this year in Women's Super League Two. The Bees were thrashed 7-0 in their first home league game of 2015 but then drew 2-2 away to Everton on 5 April. "I think we'll be a surprise for a few teams who will think they're going to roll us over," Broomes told BBC Sport. "We've had to make a lot of changes and we're still adapting. This is the top end of women's football and some of my players are still 17 and 18." Broomes' side, who finished bottom of WSL 2 last season with eight points from 18 games, host sixth-placed Durham at the Hive on Sunday. "We had some discussions at training and some people did admit to not having their best game (against Reading)," he added. "A lot of the players are very nervous, but the girls are really working hard to make the right decisions. "At Everton, we were disappointed in the end that we didn't get thee points but, collectively, we see it as a point gained." "Sometimes it boils down to mental toughness. We have to be disciplined in our roles and responsibilities and be able to see out the game."